Phillies president Andy MacPhail discussed his team’s winter plans in an end-of-season press conference today at Citizens Bank Park. Matt Breen of the Philadelphia Daily News and Corey Seidman of NBC Sports Philadelphia (two links) have the details…. The Phillies will likely continue to have a “relatively low payroll” in 2018, a year after slightly topping the $100MM in their Opening Day payroll. With only around $6MM on the books for next season, however, that gives the club plenty of room to spend if necessary. The team will at least be open to creative spending, as MacPhail said that ownership “did not react extraordinarily well in the beginning” to the news of another low-payroll campaign. “Ultimately, they’re OK with it with one proviso: that if an opportunity presents itself, we do not exclude it. They understand the program,” MacPhail said. One possibility is that the Phillies could use some of their payroll space to take on bad contracts from other teams. “Most of you guys have written about how the ’18 (free-agent) class is a little on the light side, all the big guns come out in ’19. It may well be that teams that want to compete in that ’19 arena shed some salary that we won’t anticipate right now in ’18. So we have to keep our eye out for that, as well,” MacPhail said. The club took on payroll last winter while acquiring Howie Kendrick, Pat Neshek, and Clay Buchholz in trades, and flipped Kendrick and Neshek in midseason trades for prospects. While the rotation needs some serious upgrades, MacPhail hinted that the Phillies were likelier to obtain pitching via trades than in free agency. “There are times when you’re going to have to dive into that [free agent] pool and just take a risk. But it’s not my favorite place to be,” the president said. “We get inundated with stories across the game about how everybody is looking for starting pitching. ’Just get two quality starters, and we’ll be all set.’ Well, you might as well look for a unicorn at the same time. It’s tough. You don’t want to be paying for past performance.” MacPhail also noted that the possibility exists that the Phils could deal from their farm system to add help for the big league roster. The club hopes to have a new manager hired before the GM Meetings in early November. The Phillies will continue to build and spend money on their analytics staff, which MacPhail mentioned has grown from a one-person department to a 14-person team. Pitch-framing is one specific area that MacPhail said the Phillies are looking to improve on an organization-wide basis in 2018. Baseball Prospectus was very unimpressed by the framing abilities of Cameron Rupp and Andrew Knapp, respectively ranking the two Philadelphia catchers 110th and 115th out of 116 MLB catchers. Nationals ace Max Scherzer has been recovering from a stress fracture in the knuckle of his right ring finger, and he’s on track to throw off a mound for the first time this spring on Saturday, Mark Zuckerman of MASNsports.com reports. If everything goes according to plan, he’ll progress to bullpen sessions and be game-ready in a couple of weeks, Zuckerman adds. While pitching coach Mike Maddux conceded that Scherzer could be “a start or two” behind the rest of the team’s rotation, the extra time in Spring Training (which was worked in due to the World Baseball Classic) will prove beneficial to Scherzer. Both Stephen Strasburg and Tanner Roark threw in an intrasquad game today as well, Zuckerman notes — a particularly important note for Strasburg. The 28-year-old righty saw his 2016 season end in early September due to a flexor mass strain but was able to throw his fastball, curveball and changeup in Thursday’s session. The Phillies will be without hard-throwing right-handed relief prospect Victor Arano for at least one month, per CSNPhilly.com’s Jim Salisbury. The 22-year-old, who averaged about 94 mph on his fastball in 2016, has been diagnosed with a sprained ulnar collateral ligament in his right elbow. While surgery hasn’t been recommended, Arano did receive a platelet-rich plasma injection that will sideline him for the bulk of Spring Training. Though he was never likely to break camp with the Phils, it’s still discouraging for the team to see the promising young see his development set back. Last season, Arano posted brilliant numbers between Class-A Advanced and Double-A, working to a combined 2.26 ERA with 10.7 K/9 against 2.1 BB/9 across 79 2/3 innings of work. Arano rated 23rd among Phillies prospects entering the season, per MLB.com, while ESPN’s Keith Law rated him 16th. “If there’s a Ken Giles in the system right now, it’s him,” Law wrote of Arano. 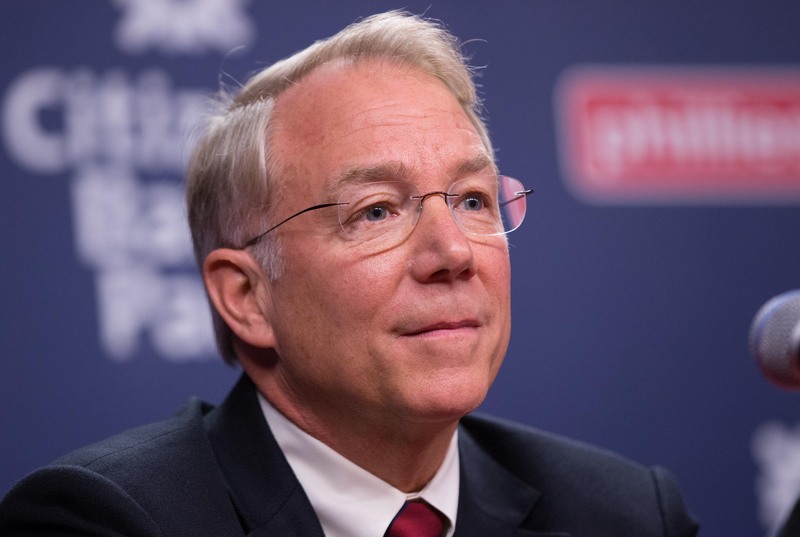 Andy MacPhail’s career in baseball spans several decades, but the Phillies’ president is leading the charge to help modernize his organization, writes MLB.com’s Todd Zolecki. MacPhail, who took charge of the Phillies following the 2015 season, explained to Zolecki the myriad changes that are being made all throughout the organization. Improvements not only to the team’s analytics department but also to nutrition programs in the minor league ranks and a new facility opening in the Dominican Republic are just some of the changes that have been ushered in. MacPhail also sounded intrigued by the Rays’ recent decision to push back the start times of their spring workouts for players and cited an interest in sleep science studies. Beyond that, he noted that the Phils will be looking to hire a replacement for EVP/COO Mike Stiles, who will be retiring in June, though there’s been no determination on whether they’ll go with an internal or external hire. The Minnesota Twins surprised the baseball world in 1987 when they finished first in the American League West with an 85-77 record – just one season after going 71-91. But they didn’t stop there; the Twins stunned Detroit (98-64 in the regular season) to win the A.L. Championship Series, then shocked St. Louis (95-67) to bring home a World Series title. Just four years later, after a complete retooling of the pitching staff, the 1991 Twins rebounded from a last-place finish the year before to win the A.L. West. After dropping nine of their first 11 games, they started putting things together – and eventually went on a 24-3 tear from May 28-June 25 (including a 15-game winning streak). By the time that stretch ended, they found themselves atop the divisional standings – and never entered a day’s action the rest of the season looking up at anyone. After defeating Toronto in the ALCS, they outlasted Atlanta in the worst-to-first World Series to bring home another trophy. The architect of both championship clubs was Andy MacPhail, who was just 32 years old when he took over as Minnesota’s General Manager in August 1985. Now the President of the Philadelphia Phillies, MacPhail took some time to speak to MLB Trade Rumors about the 1991 Twins in this – the 25th anniversary of their last World Championship. The pitching staff was completely overhauled between 1987 and 1991. The front three in 1987 were Frank Viola, Bert Blyleven and Les Straker; by 1991, Jack Morris, Scott Erickson and Kevin Tapani sat atop the rotation. Jeff Reardon was the closer in 1987; Rick Aguilera was in that role in 1991. The best pitcher on the 1987 team – and the most recognizable – was Frank Viola, who earned World Series MVP honors that season and went on to win the A.L. Cy Young Award in 1988. The trade of Viola at the July 1989 deadline turned out to be a big reason why the Twins won the 1991 World Series, as three pitchers acquired for him – Tapani, Aguilera and David West – became key members of the Minnesota staff. From a fan standpoint, moving such a popular player and person as Viola had to be tough. MacPhail was asked if it was harder to remove him from the team because Minnesota was a small market club. A year and a half later, the Twins were playing in the 1991 World Series. Vindication, or still a tad conflicted? “No, the end game object is to be the last club standing. We were able to accomplish that. The pitchers we acquired in that deal were big parts of it. So I felt the actions of the organization were justified,” he said. The Twins were a last-place club in 1990 but added some key players in the off-season – notably Jack Morris. In order to land Morris, MacPhail offered the veteran a player option. As pointed out recently by New York Daily News writer Anthony McCarron in a story about Yoenis Cespedes and the Mets, MacPhail is credited with the creation of the modern-day player opt-out clause. As opposed to the overhaul of the pitching staff, the core group of position players from 1987 through 1991 was largely unchanged. Kirby Puckett was in the midst of his Hall of Fame career. Kent Hrbek, Greg Gagne and Dan Gladden were important players on the field and in the clubhouse. The Twins went to camp in 1991 with a roster that would carry them through the season – as they didn’t make any big in-season moves. MacPhail was asked how he realistically looked at the club he had constructed when the squad reported to Florida for spring training. It’s 25 years later. MacPhail has been with a few other organizations (Chicago Cubs, Baltimore Orioles, Philadelphia Phillies). He’s had success. He was asked if it’s still as fun now as it was back then. In a move that was engineered over the summer, Andy MacPhail has officially taken over the Phillies’ presidency from Pat Gillick, according to a club announcement. Gillick will continue on in an advisory capacity, per the release. He spent just over a year in the seat, which he took over temporarily when predecessor David Montgomery fell ill.
MacPhail’s hiring was announced in late June, with the team indicating that he would “oversee the entire organization, both its business and baseball operations,” upon taking the helm. He’ll do just that now, after taking the last few months to acclimate himself. With the offseason just weeks away, the first over of baseball business for MacPhail will be to identify a new general manager. The club parted ways with the embattled Ruben Amaro Jr., turning things over temporarily to Scott Proefrock while a permanent replacement was found. That process is still ongoing, with MacPhail reportedly working to hand-pick the team’s next GM. Nationals ace Max Scherzer has completed his second no-hitter of the season. The Mets fell victim to an utterly dominating outing. Scherzer fanned 17 hitters. The only base runner reached via error. The win actually has some postseason implications too. The Dodgers are now just one win away from securing home field advantage against New York. Scherzer no-hit the Pirates earlier this year. He struck out 10 in that contest. This was also the second time the Mets were no-hit (Chris Heston). Phillies starter Aaron Harang has yet to decide if he’ll play in 2016, tweets Jake Kaplan of the Philadelphia Inquirer. Harang, 37, posted a 4.86 ERA with 5.72 K/9 and 2.70 BB/9 over 166 and 2/3 innings. Through his first 11 starts, he had a 2.02 ERA and 3.10 FIP, but injuries soon sapped his production. Harang will consult with his family in San Diego before making a decision. Newly minted Phillies president Andy MacPhail is part of a long baseball tradition, writes Frank Fitzpatrick of the Philadelphia Inquirer. His father, former baseball executive Lee MacPhail once described his son as decisive, adding “he never second-guesses himself.” The Phillies will hope that decisiveness results in a rapid turnaround after a miserable season. If you’re looking to learn more about the MacPhail dynasty, Fitzpatrick provides a thorough background. Against all odds, Nationals infielder Dan Uggla won a roster spot in Spring Training and never gave it up, writes Chelsea Janes of the Washington Post. Uggla didn’t earn much playing time with the Nationals. Including two plate appearances today, he’s hit .183/.298/.300 in 141 plate appearances. Uggla believes his vision and health are back to where they were in his Marlins days. While it’s unclear if Uggla will find a guaranteed contract this offseason, multiple sources with Washington praised his clubhouse presence. The Braves hope to re-sign catcher A.J. Pierzynski, reports David O’Brien of the Atlanta Journal-Constitution. The soon-to-be 39-year-old had a remarkably productive season after signing a one-year, $2MM contract over the offseason. He’s hit .300/.339/.430 with nine home runs. Pierzynski figures to receive some attention in free agency, but teams may be wary of his age and reputation. Mets starter Steven Matz is starting to build a reputation as injury prone, writes Andy Martino of the New York Daily News. Personally, it seems too soon to worry over seemingly minor injuries – even if they are poorly timed. However, one rival executive wondered “is he one of those guys where there is always going to be an issue?” For now, the Mets have to decide if and how they want to use him in the postseason. However, it’s possible the club could use him as trade bait over the offseason given their rotation strength. His trade value will be at a low point if rival clubs view him as an injury risk. Marlins outfielder Ichiro Suzuki aims to play 10 more years, writes David Waldstein of the New York Times. The former Mariners star has played in 150 games for Miami due to a serious of injuries in the outfield. He’s posted a .233/.286/.284 line over 431 plate appearances. Advanced defensive measures look favorably upon his performance in the outfield. While another 10 years feels like a stretch, Ichiro should receive ample opportunity to reach 3,000 hits. He’s currently 65 shy. 10:16am: The Phillies have called a press conference at 2:30pm ET to “announce new Phillies leadership.” As MLB.com’s Todd Zolecki indicates, the presser will announce the widely expected hiring of Andy MacPhail to head the team’s baseball operations department (Twitter links). However, he adds that no new manager will be named this afternoon, and Ruben Amaro will remain in the GM’s chair, for now. Last week, Jon Heyman of CBS Sports reported that MacPhail would be hired within the week to fill a role similar to that of interim president Pat Gillick. Reports of the club’s interest in MacPhail date back to mid-June, when CSNPhilly.com’s Jim Salisbury first broke the news. By bringing MacPhail on board, the Phillies will hire an executive with experience in leading three franchises. MacPhail was the Twins’ GM during the team’s 1987 and 1991 World Series victories. He served as the Cubs’ president for more than a decade from the mid-90s into the mid-2000s, including the team’s 1998 and 2003 postseason berths. MacPhail moved from Chicago to Baltimore, where he served as president of baseball operations and helped lay the foundation for the perennial contender that is now in place in Baltimore. MacPhail acquired Adam Jones and Chris Tillman in a lopsided trade that sent Erik Bedard to Seattle, and he also acquired Chris Davis and Tommy Hunter from the Rangers in exchange for Koji Uehara. J.J. Hardy’s presence in Baltimore is also MacPhail’s doing; he acquired the shortstop from the Twins (alongside the remaining money on Brendan Harris’ contract) in exchange for relievers Jim Hoey and Brett Jacobson. By coming on board with more than a month until the trade deadline, MacPhail will be in position to do some evaluation and weigh in on what is expected to be a franchise-altering month for the Phillies. Names like Aaron Harang, Jonathan Papelbon and Ben Revere could all find themselves traded within the month, but the most impactful expected move, is of course, a potential trade of Cole Hamels. The longtime Phillies ace is the type of elite arm that can command a package significant enough to single-handedly reshape the team’s future, and the veteran executive will now be in place to have some input on that critical trade. Additionally, MacPhail will be able to evaluate internal matters, including Amaro’s position with the team and, potentially, the hiring of a new manager to oversee the club in the wake of Ryne Sandberg’s resignation. Andy MacPhail Newsstand Philadelphia Phillies Ruben Amaro Jr.
2:16pm: The Phillies plan to name MacPhail as their top baseball decision-maker within the next week or so, Heyman writes in a full column. MacPhail’s title is expected to be named as the new team president, or something similar to that title. Upon MacPhail’s hiring, Gillick would shift to a consulting role similar to the one he held before assuming presidential duties in the wake of former president David Montgomery’s health concerns. 1:54pm: The Phillies plan to appoint former Twins/Cubs/Orioles executive Andy MacPhail to a key spot within their front office in the near future, reports Jon Heyman of CBS Sports (via Twitter). Jim Salisbury of CSNPhilly.com first reported earlier this month that the Phils were eyeing MacPhail as a potential key decision-maker in their front office. It’s not clear specifically what role MacPhail will fill, but 77-year-old team president Pat Gillick has stated in the past that he doesn’t envision remaining in the role for the long-term. (Gillick also recently told the Philadelphia Inquirer’s Bob Brookover that he expected the team to make a front office hire in the near future.) It seems unlikely that MacPhail would replace GM Ruben Amaro Jr. at this stage, though he could enter the organization in a fashion similar to that of Tony La Russa in Arizona last season. La Russa was named “Chief Baseball Officer” of the D-Backs last May and oversaw the front office throughout the summer, weighing in on baseball operations decisions before ultimately deciding to replace then-GM Kevin Towers in the offseason. MacPhail has spent a significant amount of time heading baseball operations departments over his career as an executive. He served as the Twins’ GM during the team’s World Series victories in 1987 and 1991, and he spent nearly a decade as the president of the Cubs following that position. MacPhail left Chicago to become the Orioles’ president of baseball operations, where a number of moves that he made served as the foundation for the Orioles’ current contender. MacPhail was heading Baltimore’s baseball ops department when the team traded Erik Bedard to Seattle in exchange for a package of prospects highlighted by franchise center fielder Adam Jones and right-hander Chris Tillman. He also acquired J.J. Hardy from the Twins in exchange for a pair of fungible minor league relievers and picked up Chris Davis and Tommy Hunter from the Rangers in exchange for Koji Uehara.